Nagoya Station, Fushimi and Sakae are the three main downtown areas of Nagoya - with Sakae being the city center. By subway it is only a few minutes between each station - on foot, about 10 mins from Sakae to Fushimi, and 20 from Fushimi to Nagoya Station. The Kanayama and Imaike station areas are much quieter and smaller. JR Nagoya Station is where the bullet train stops, so usually the first station one arrives at. Around and near the station are nice restaurants, department stores and an underground shopping mall on the east side. Directly above Nagoya station is the Marriot Associa Hotel. Sakae station, Nagoya's downtown shopping and nightlife district, is two stops away on the Higashiyama Subway line. Click above banner for info and map! Fushimi is a nice office area with several hotels, and a good amount of restaurants and bars - most near the Nagoya Hilton Hotel. Fushimi station is between Nagoya Station and Sakae station, the two main shopping and nightlife areas for Nagoya. Sakae is less than a 10 minute walk away. 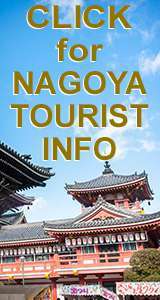 One station South or a 15 minute walk is Osu-Kannon, Nagoya's top buddhist temple. Click above banner for info and listings! 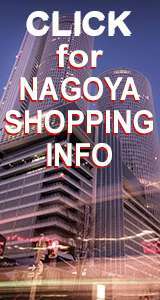 The Sakae station area is Nagoya's downtown and the center for Nagoya shopping, restaurants, and nightlife. There are many restaurants around Sakae station and throughout the area; the main shopping street is Otsu-dori avenue lined with top departments stores and clothing shops. Central Park runs through the center of Sakae, with the Nagoya TV Tower on the North side. Click above banner for info and map! Kanayama Station in Nagoya is a connecting point for Subway, JR & Meitetsu lines. Its large station has a tourist info center. Just a few steps away there is also a trendy shopping center 'Asunal', the Nagoya Museum of Fine Arts, and several hotels. Click above tab for info and listings! The Imaike Station area is fairly quiet in comparison with Sakae and Fushimi, but it has a few places that are popular. Nearby Ikeshita Station and Kakuozan station also have a nice assortment of neighborhood pubs. Click tab above for info and listings!